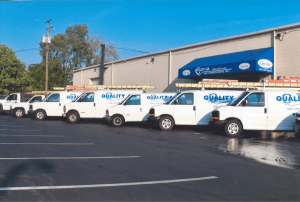 There are a lot of components involved in a properly working Columbus HVAC system. One component that many people overlook is the drain line for the air conditioning system. Your Columbus air conditioning system has condenser coils that sweat the water drawn from the air in your home as it is cooled by your AC unit. These coils produce a significant volume of water, especially when it humidity is high, so a condensate drain pan is installed to capture the moisture and keep it from damaging your home. A drain line from the drain pain out of your home is required to transfer all that extra water, but it can easily become clogged by debris in the area or simply from heavy condensation. If this happens, the drain line might need to be cleared or even replaced. Full inspection of your drain line involves checking quite a few components, in short, you want to look for evidence that your condensate drain is overflowing or that the liquid in your drain pan is backing up into the air handler. You may also notice that there is no liquid coming out of the condenser – a sign that there may be a major problem in the system that needs immediate inspection. If this happens, make sure you check for blockages and if nothing is present, call a contractor. Each year, it is recommended that you have a tech clean your drain line to make sure it is clear and ready for the summer’s heavy cooling and high humidity. If your drain line is not clearing properly or you think there may be structural damage suffered during the winter, call a Columbus air conditioning professional for a more thorough inspection. If you have regular maintenance done on your AC system each spring, this should be part of the process so make sure you write down any questions you have for when the contractor visits your home. To schedule a service call today, give Quality Air Heating and Air Conditioning a call!